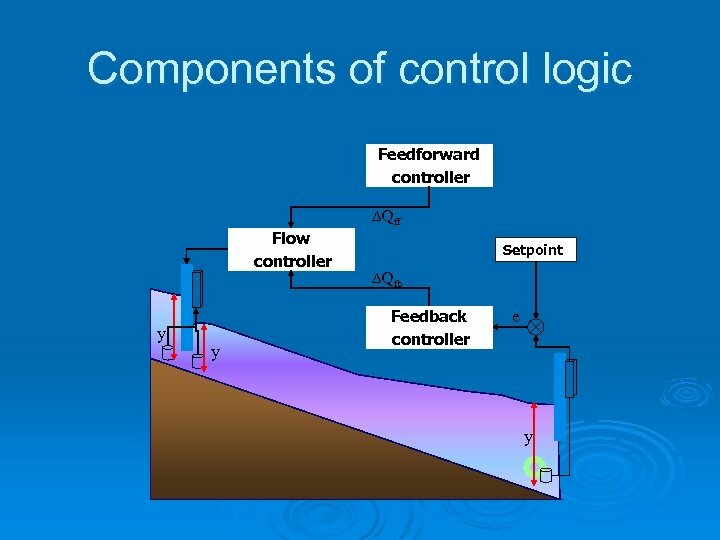 What have we learned so far? 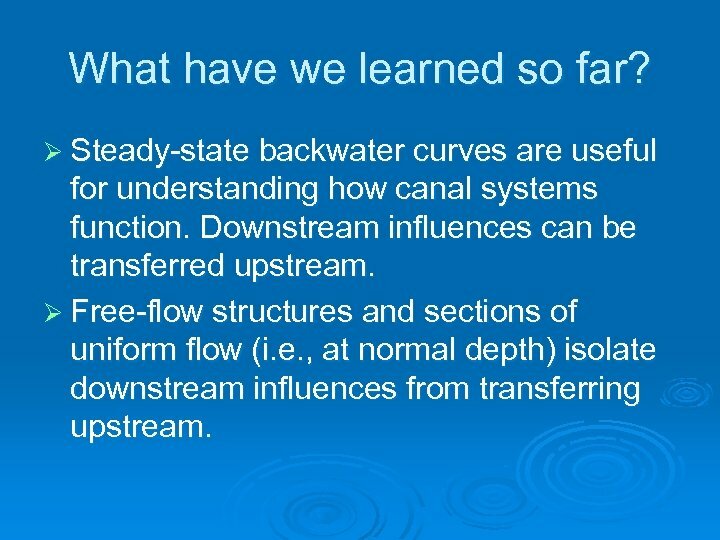 Ø Steady-state backwater curves are useful for understanding how canal systems function. 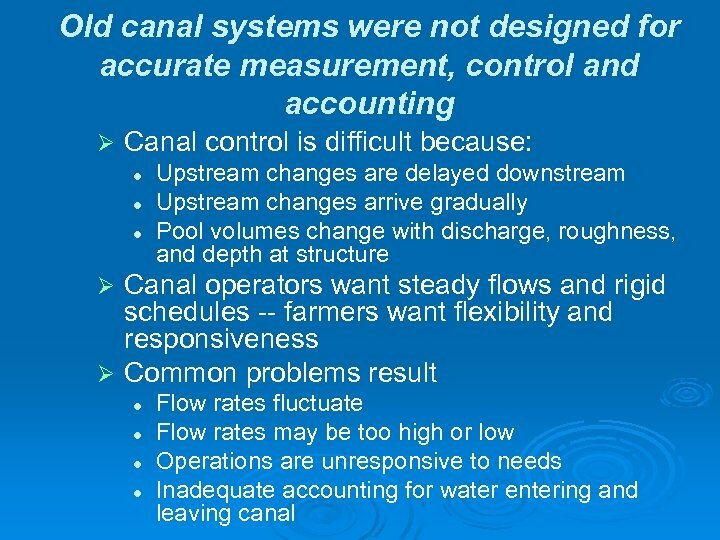 Downstream influences can be transferred upstream. 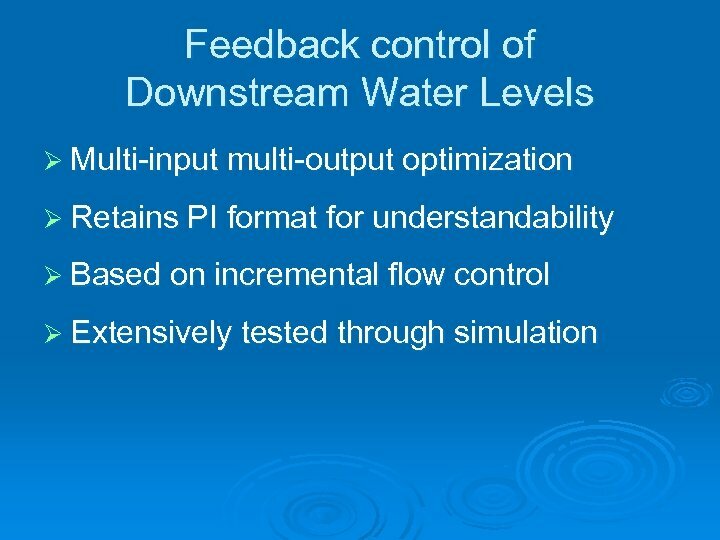 Ø Free-flow structures and sections of uniform flow (i. e. , at normal depth) isolate downstream influences from transferring upstream. 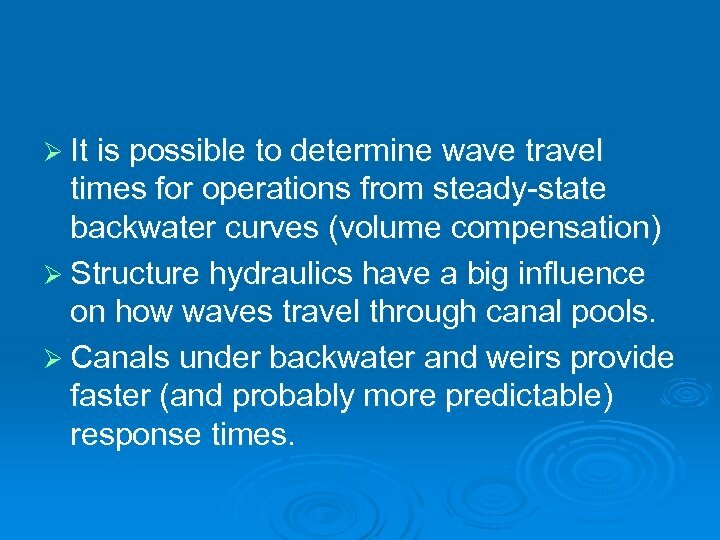 Ø It is possible to determine wave travel times for operations from steady-state backwater curves (volume compensation) Ø Structure hydraulics have a big influence on how waves travel through canal pools. 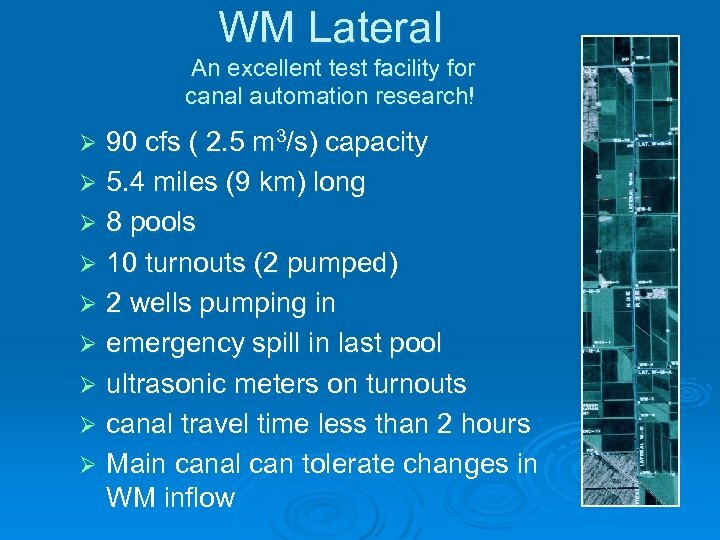 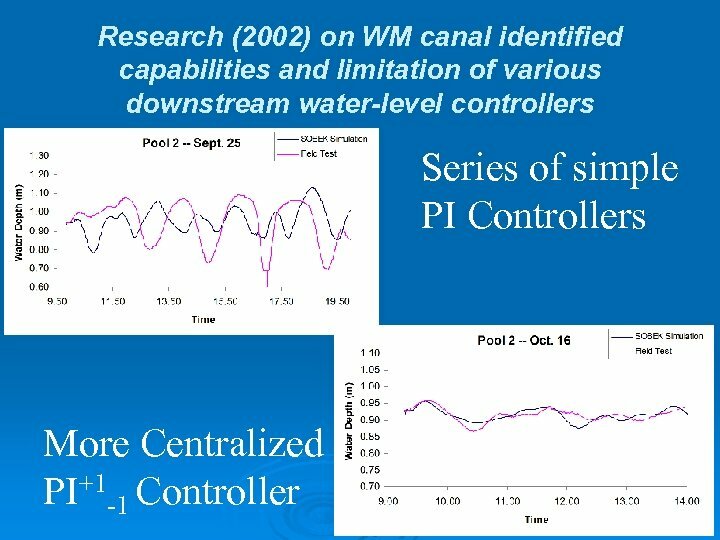 Ø Canals under backwater and weirs provide faster (and probably more predictable) response times. 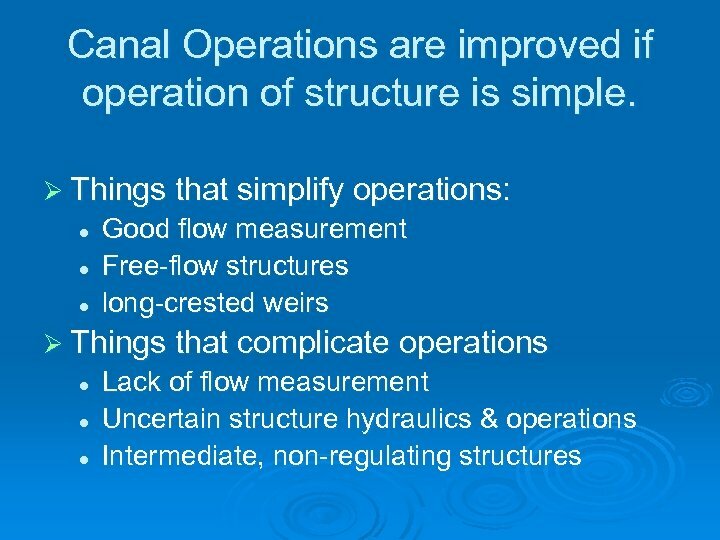 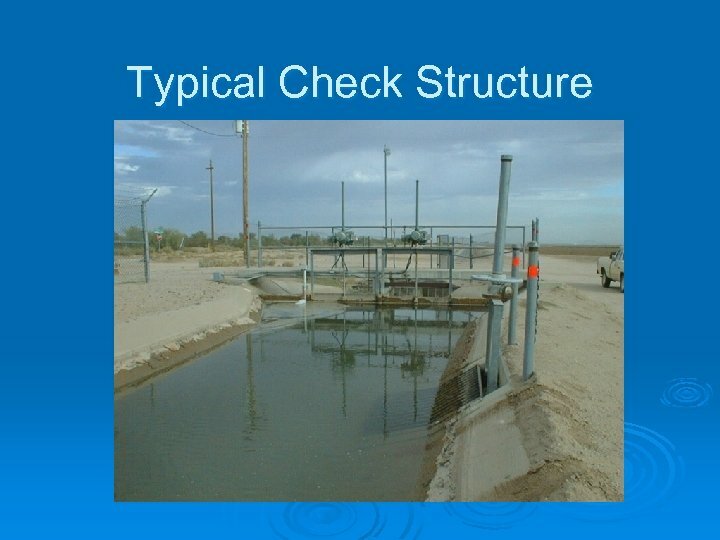 Some things we didn’t cover Ø Typical operations can be considered upstream control, since we want to keep the water level on the upstream side of structures constant. 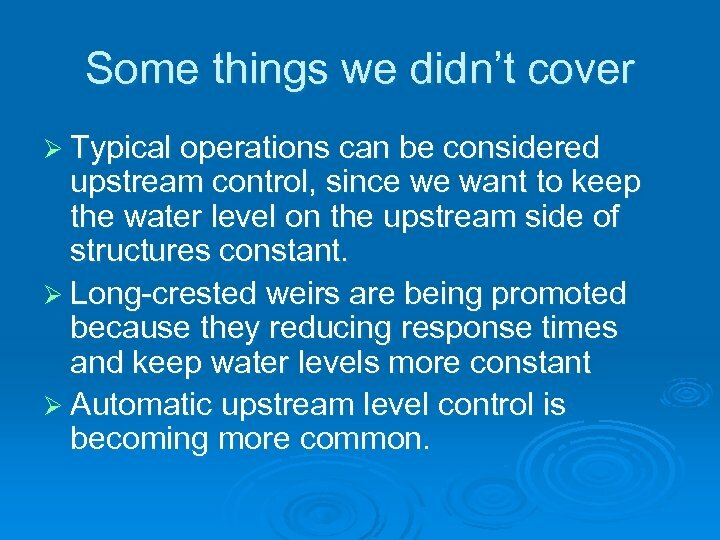 Ø Long-crested weirs are being promoted because they reducing response times and keep water levels more constant Ø Automatic upstream level control is becoming more common. 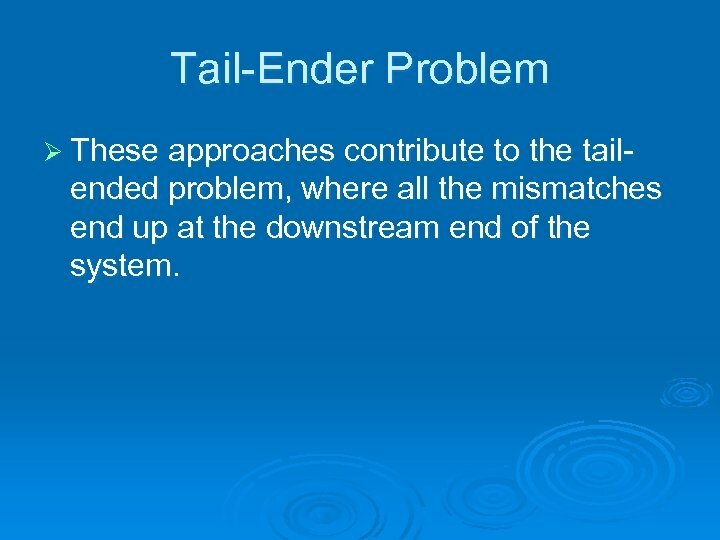 Tail-Ender Problem Ø These approaches contribute to the tail- ended problem, where all the mismatches end up at the downstream end of the system. 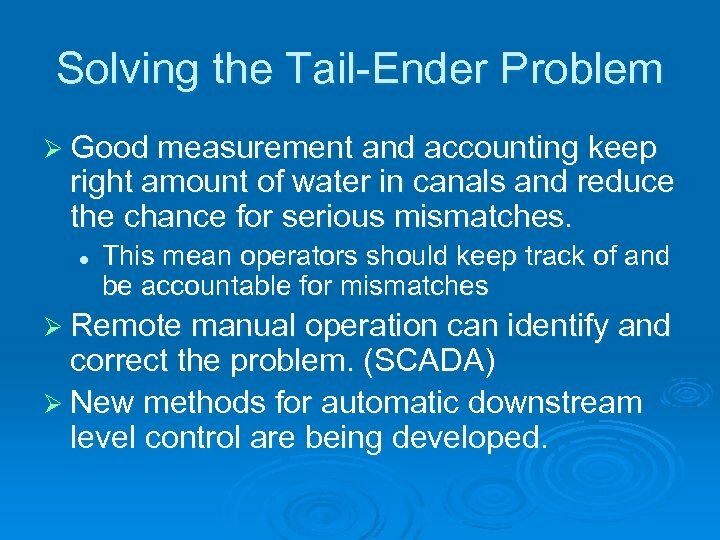 Solving the Tail-Ender Problem Ø Good measurement and accounting keep right amount of water in canals and reduce the chance for serious mismatches. 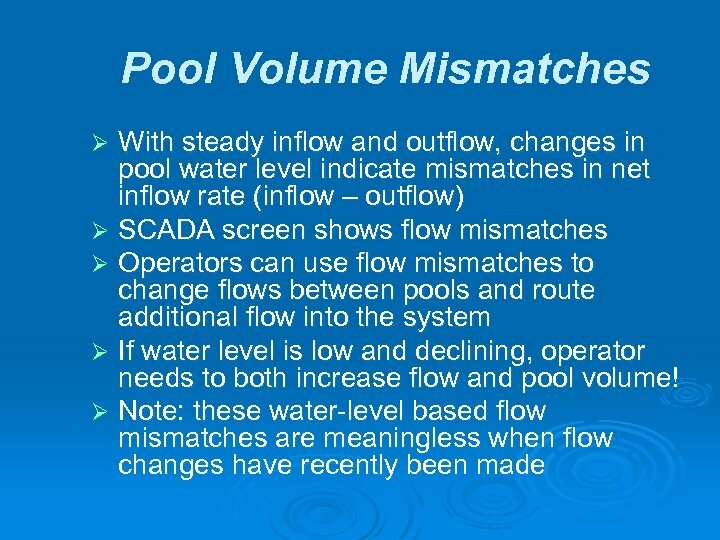 l This mean operators should keep track of and be accountable for mismatches Ø Remote manual operation can identify and correct the problem. 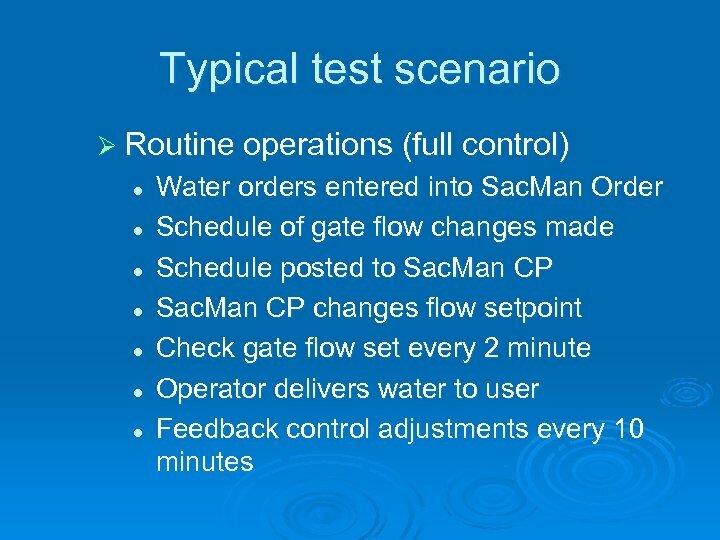 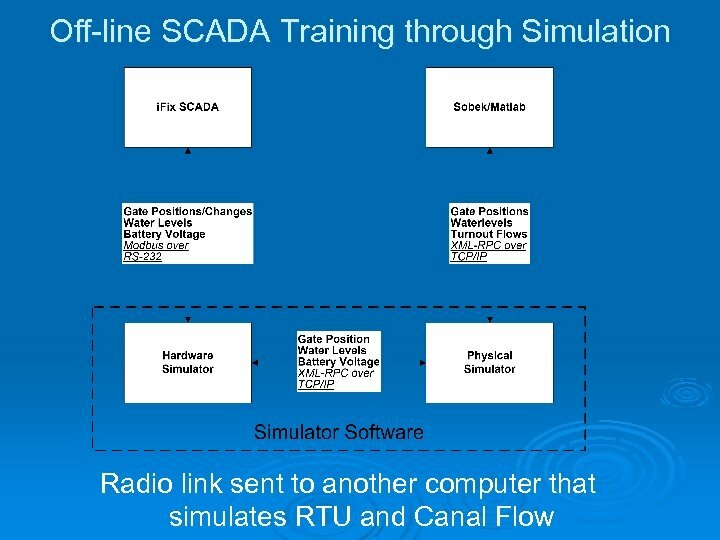 (SCADA) Ø New methods for automatic downstream level control are being developed. 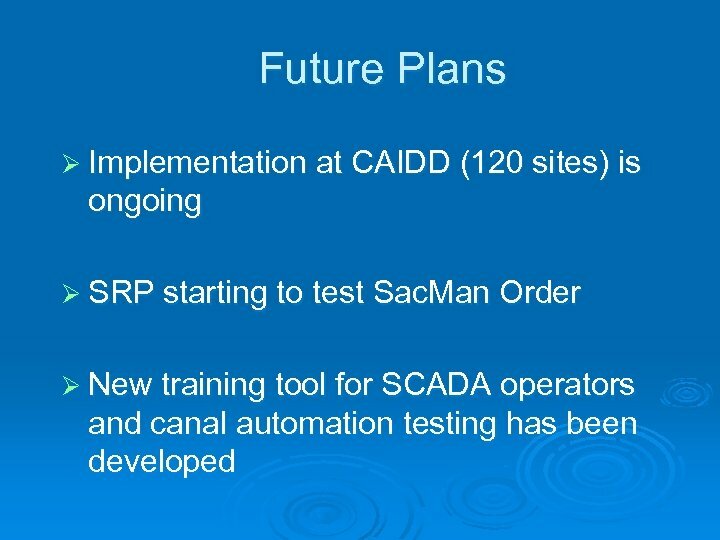 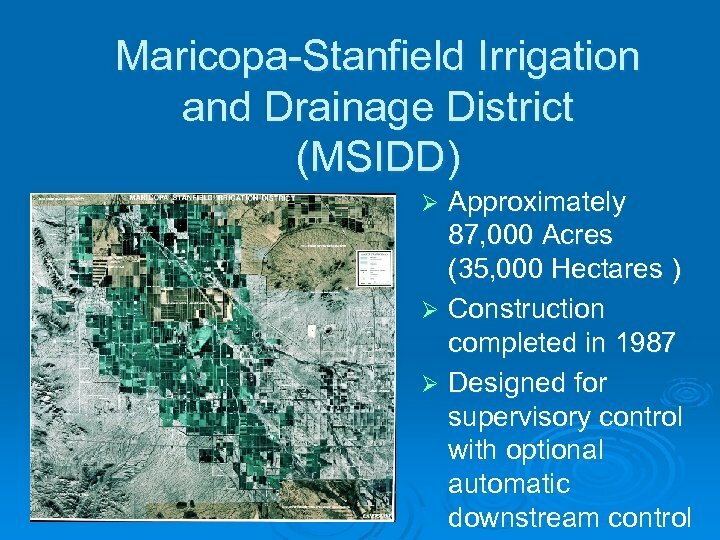 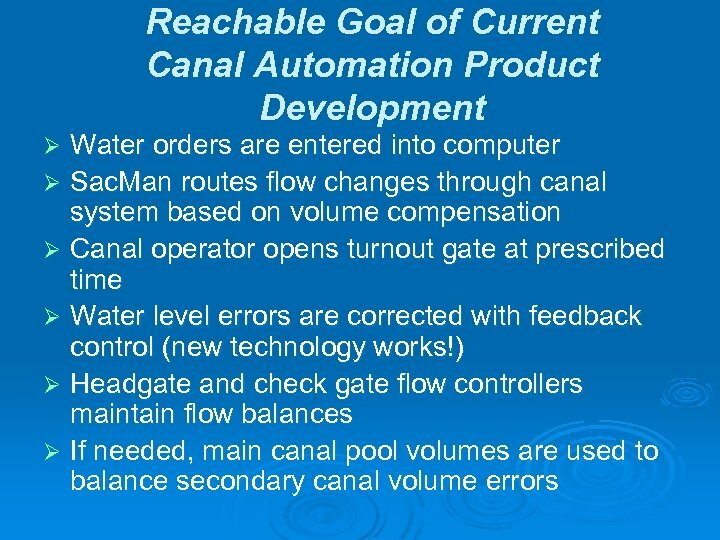 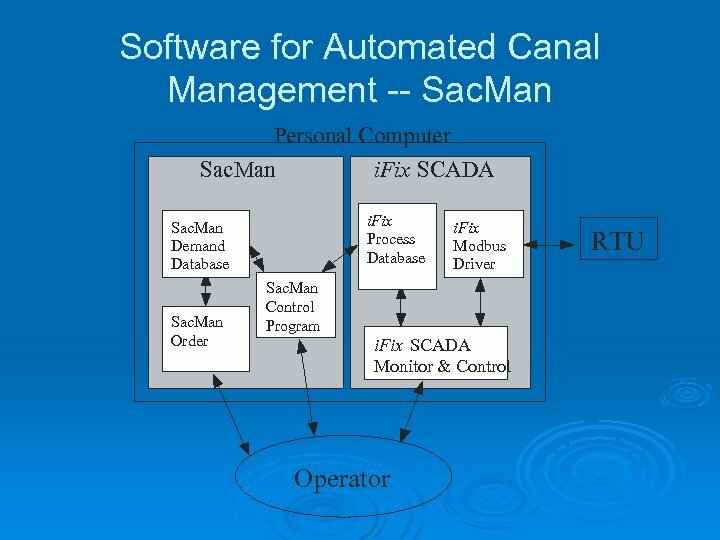 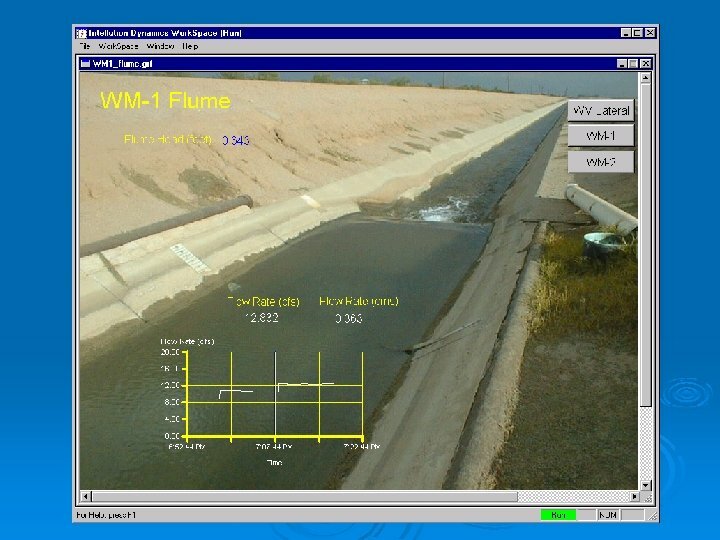 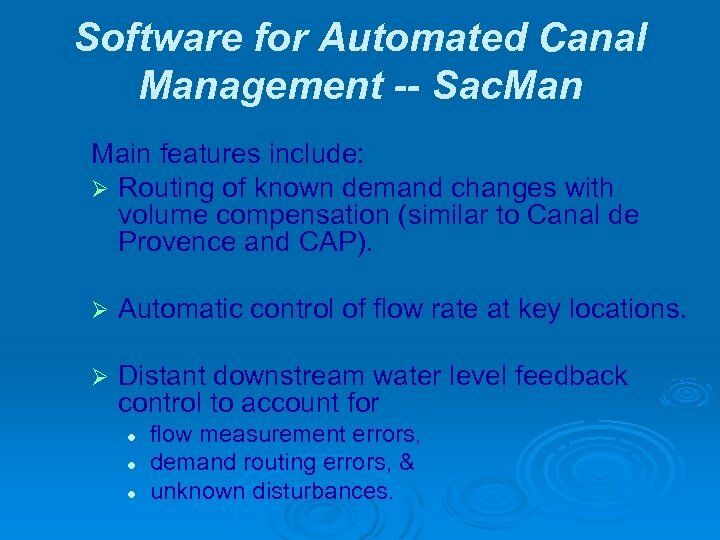 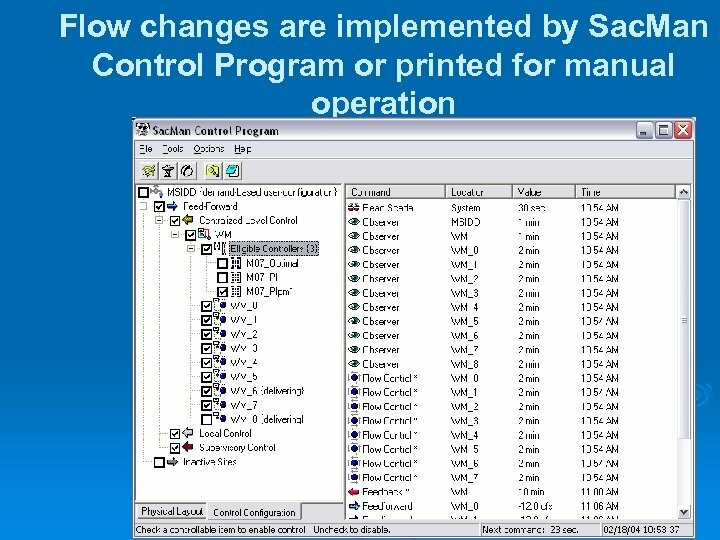 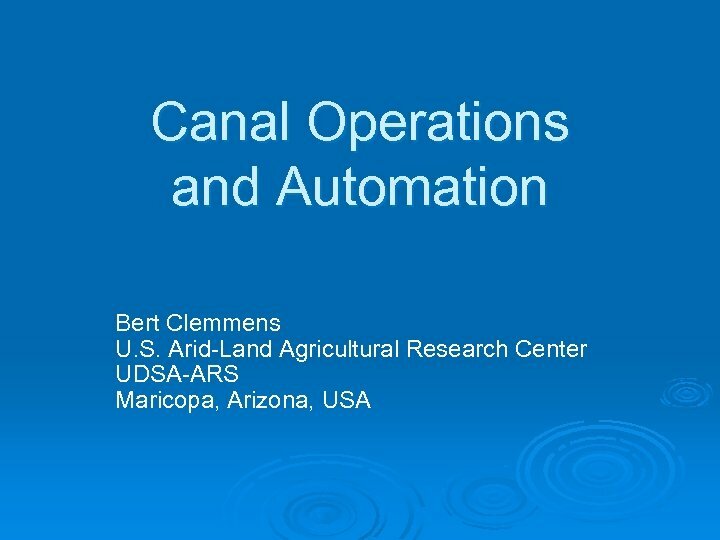 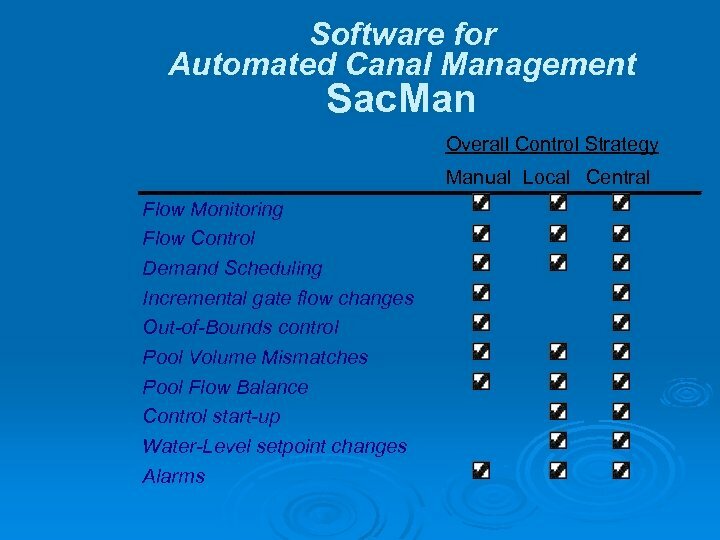 Software for Automated Canal Management -- Sac. 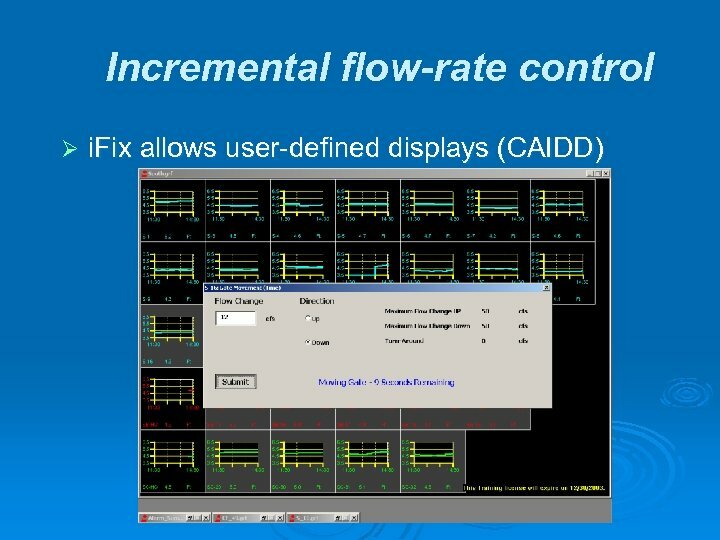 Man Main features include: Ø Routing of known demand changes with volume compensation (similar to Canal de Provence and CAP). 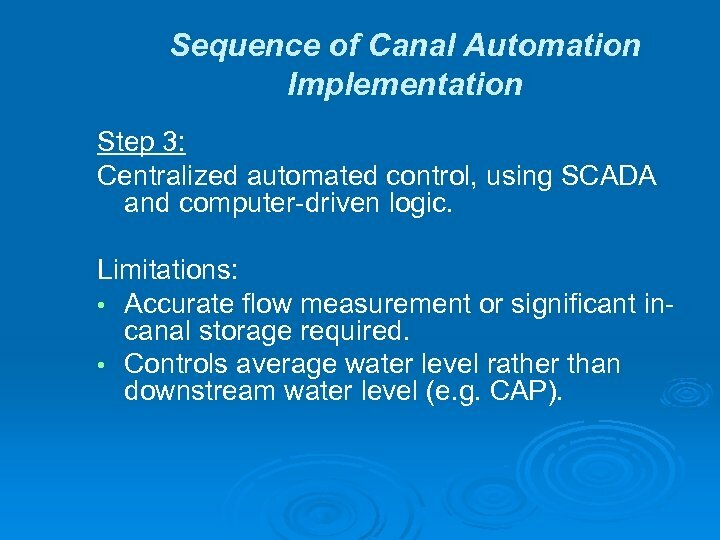 Ø Automatic control of flow rate at key locations. 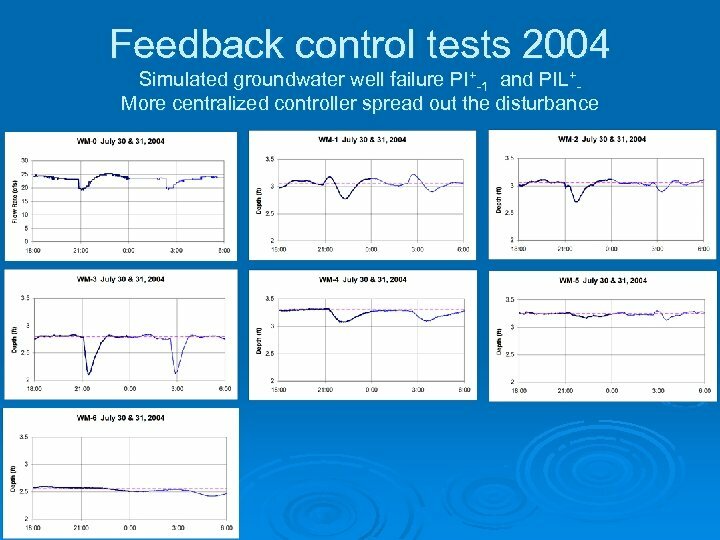 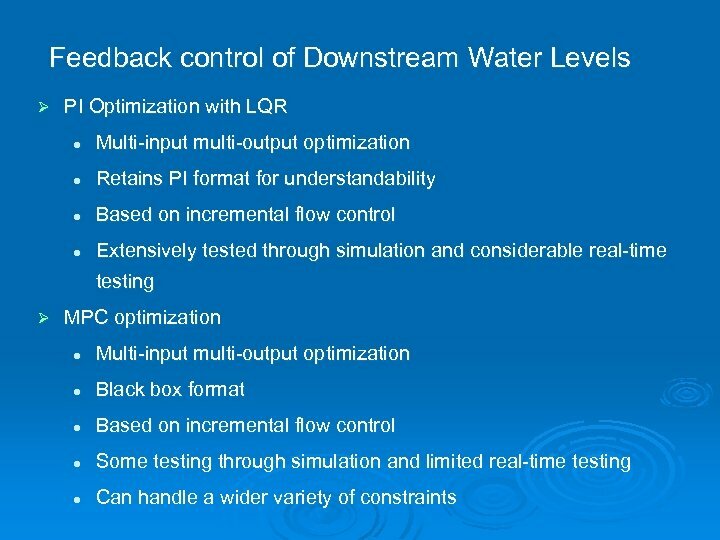 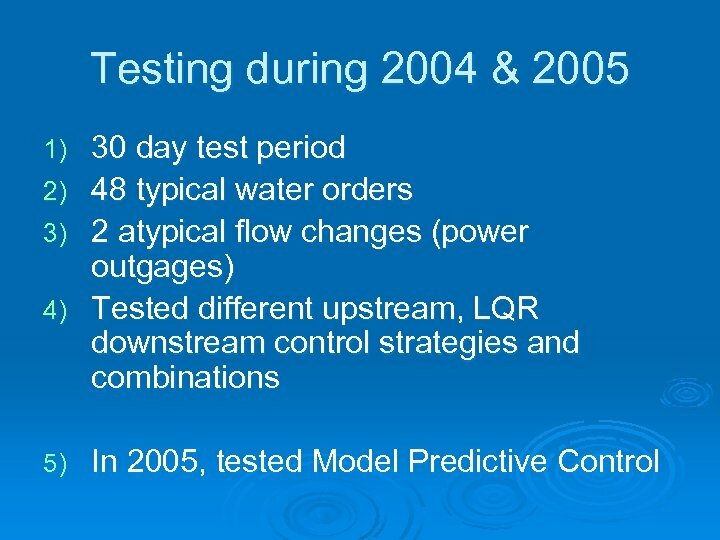 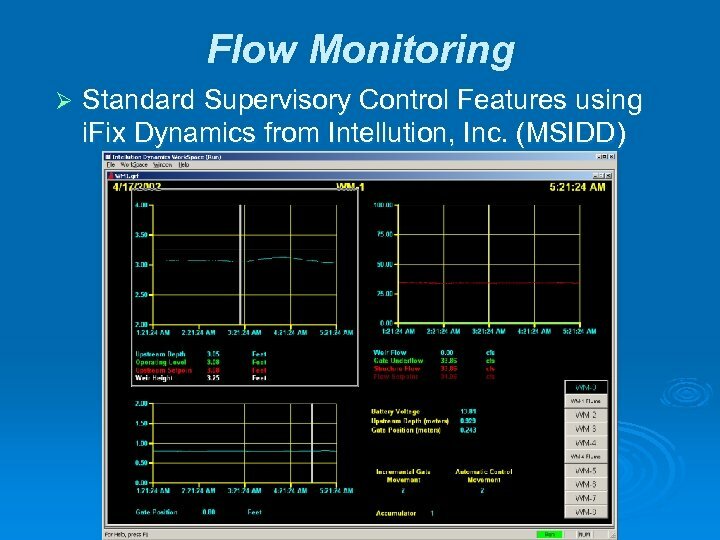 Ø Distant downstream water level feedback control to account for l l l flow measurement errors, demand routing errors, & unknown disturbances. 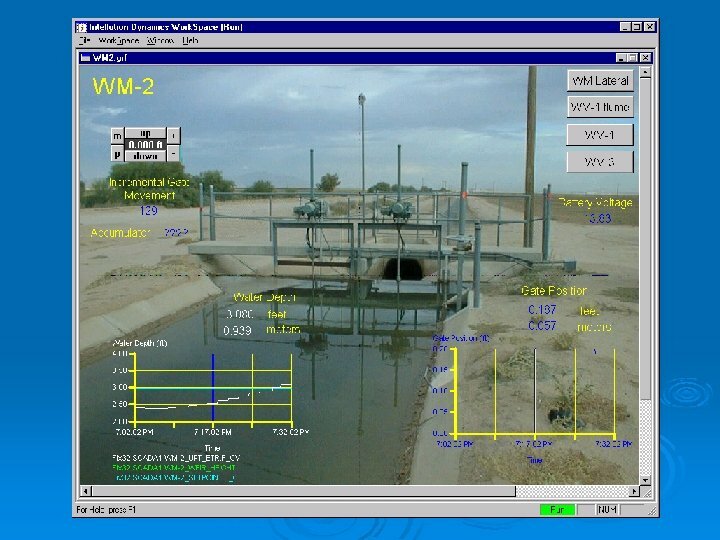 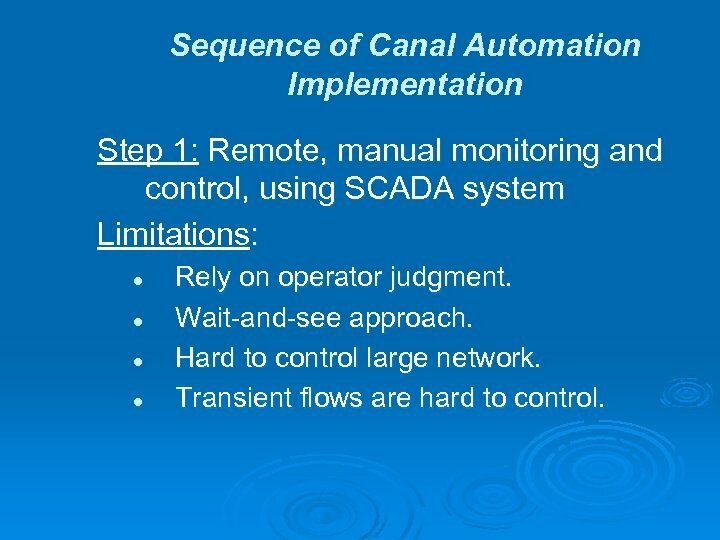 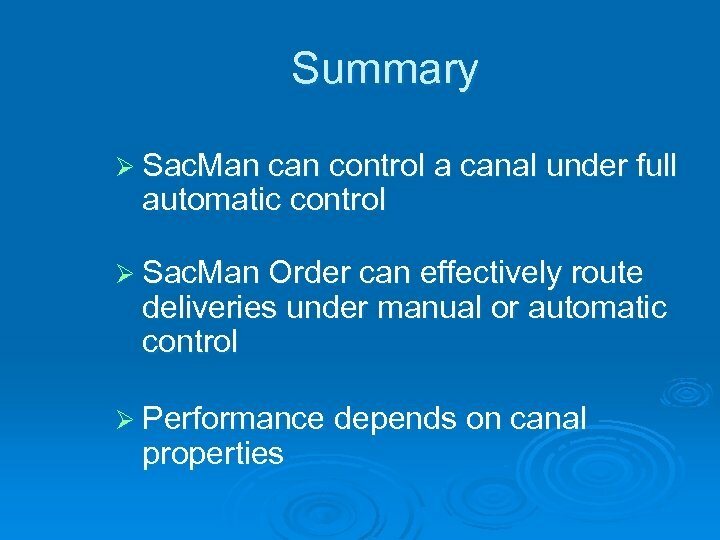 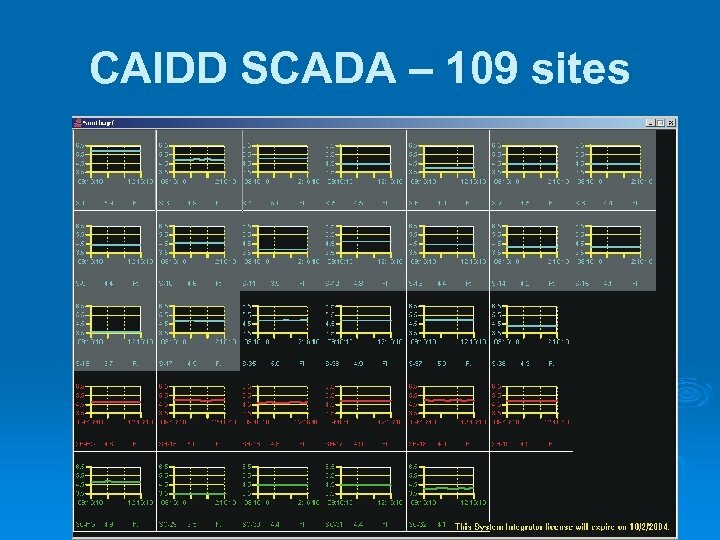 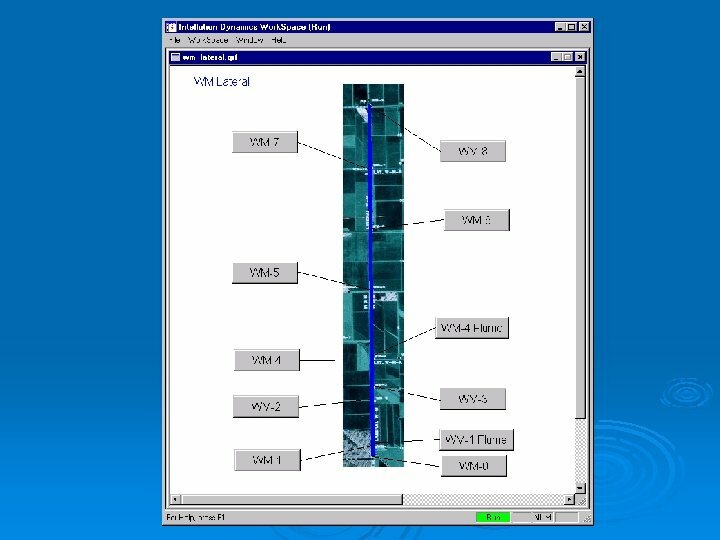 Sequence of Canal Automation Implementation Step 1: Remote, manual monitoring and control, using SCADA system Limitations: l l Rely on operator judgment. 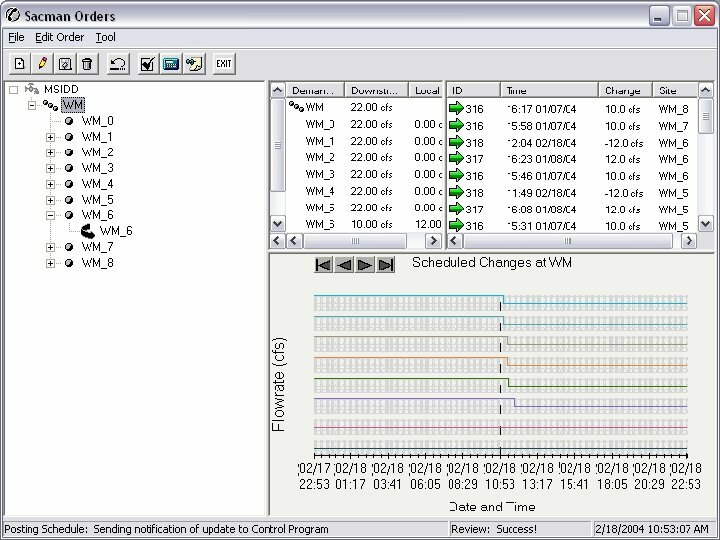 Wait-and-see approach. 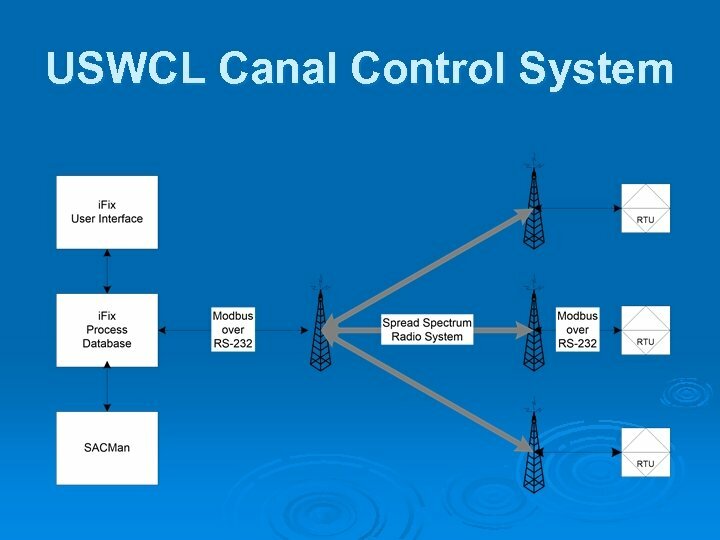 Hard to control large network. 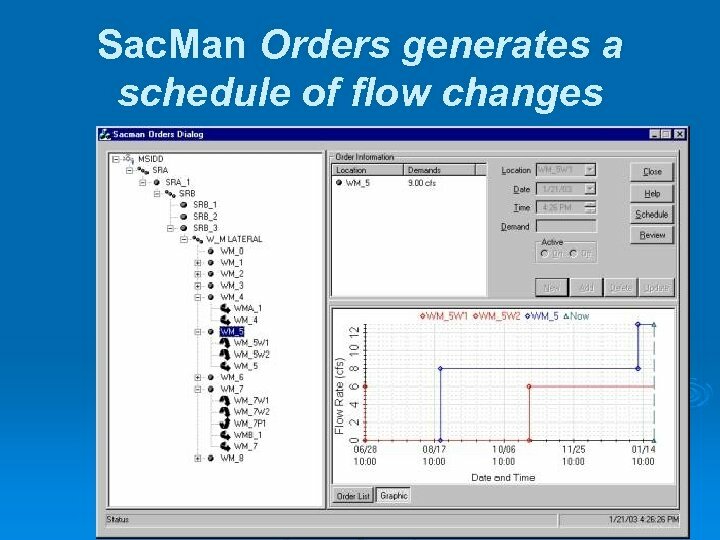 Transient flows are hard to control. 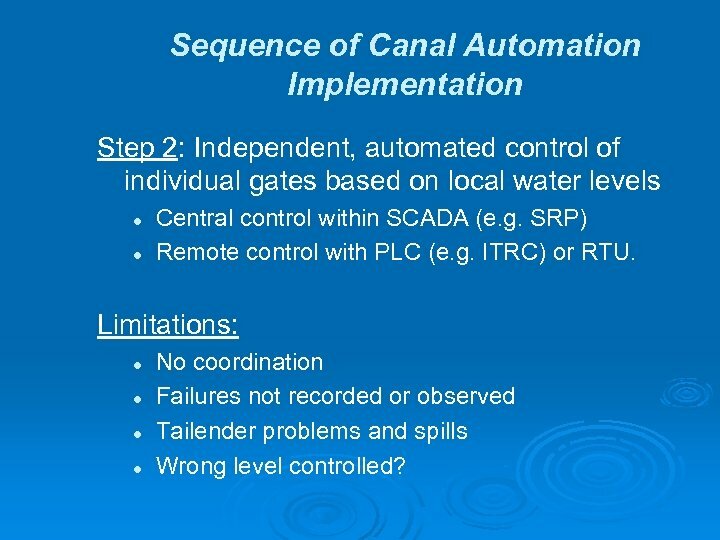 Sequence of Canal Automation Implementation Step 2: Independent, automated control of individual gates based on local water levels l l Central control within SCADA (e. g. SRP) Remote control with PLC (e. g. ITRC) or RTU. 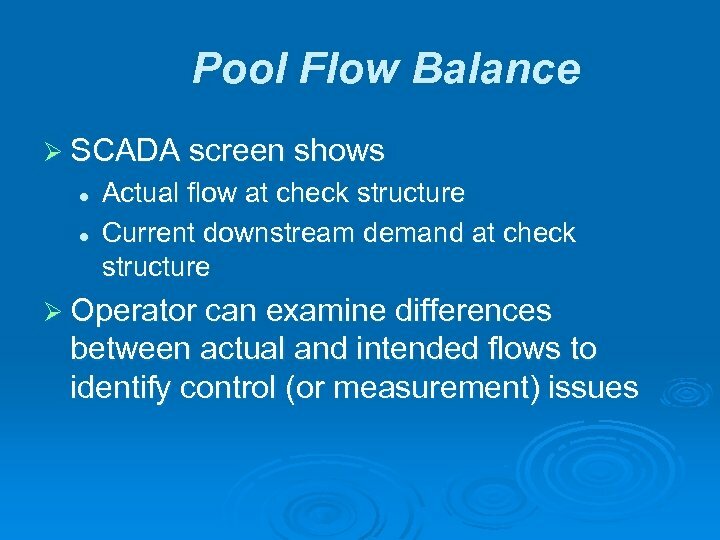 Limitations: l l No coordination Failures not recorded or observed Tailender problems and spills Wrong level controlled? 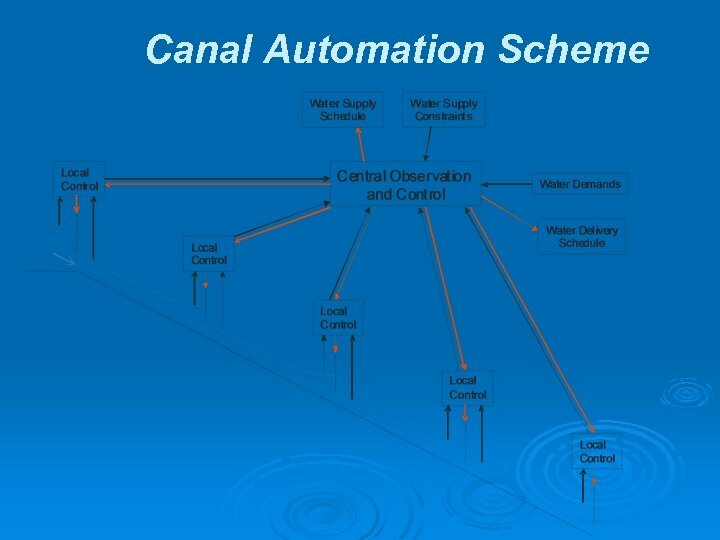 Sequence of Canal Automation Implementation Step 3: Centralized automated control, using SCADA and computer-driven logic. 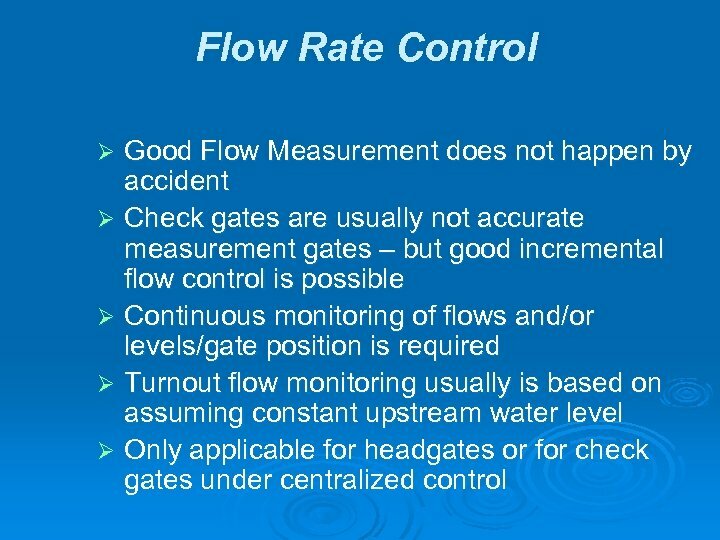 Limitations: • Accurate flow measurement or significant incanal storage required. 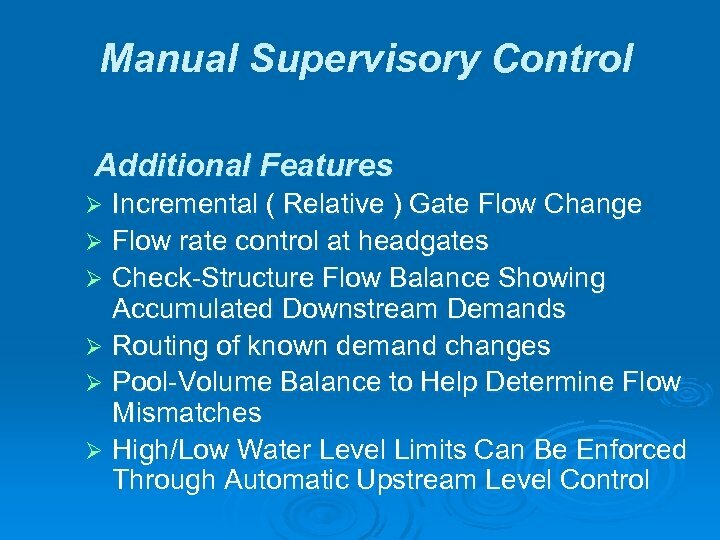 • Controls average water level rather than downstream water level (e. g. CAP).